I don't normally paint dark angels, but years ago when I was first starting my Iron Scythes, I painted up one of their all metal dreads for use in my army. 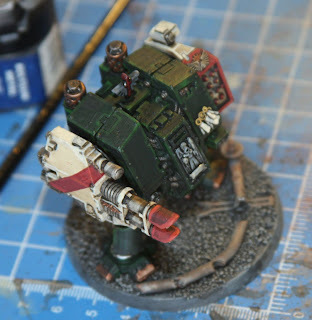 After a bath in simple green all of the gloopy ~15 year old paint was removed and a very heavy dread emerged. The mold is kind of wonky, with pits everywhere. Rather than do any cleanup work I just decided to lay down some paint with my air brush. that makes it really hard for me to work with, even though I normally really like thinned paint. challenge my painting skills. Maybe I should invest in some more simple green! Anyone have a good recipe for clean looking DA green armor? I've mentioned in previous posts that I am building a multi-regiment guard force. So far I have cadians, original guard, valhallans, armageddon steel legion, and storm troopers painted. 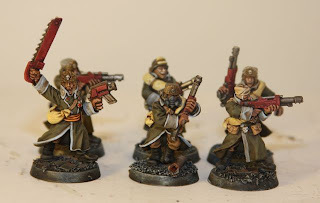 I have Death Korps of Krieg, Kraskins, and a large voystroyan force yet to paint. When I started this project the idea was to be able to paint as many different units as I wanted, but retain a similar style so they all fit together. 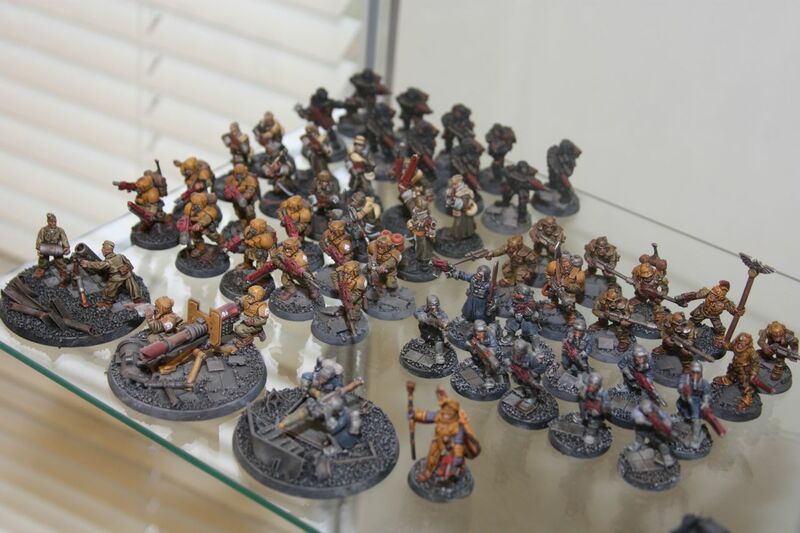 My grey knight force draws from these guys as well. 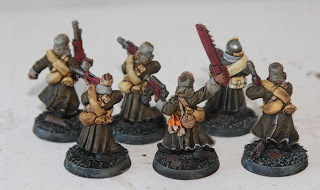 I have about 50 voystroyans to paint, but other than that the largest element is the cadians so the other units play off of their primary colors. I think the force is coherent visually, even though they are all different models. Do other people build forces this way? 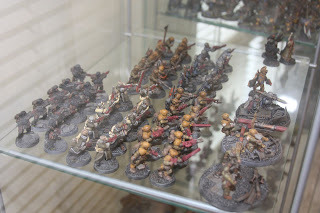 It does seem a little scatter brained at first, but every time my steel legion guys take casualties it means something, since they are the only unit from their regiment in the army. Lord Solar is a unifying character since it would make sense for him to have all of these different forces acting as his body guard. The only element where I have not drawn from multiple regiments is with the tanks. 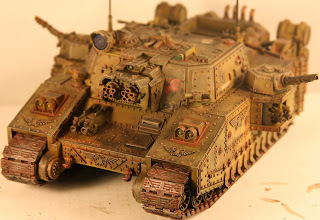 I wanted the armored company to have a unified look. 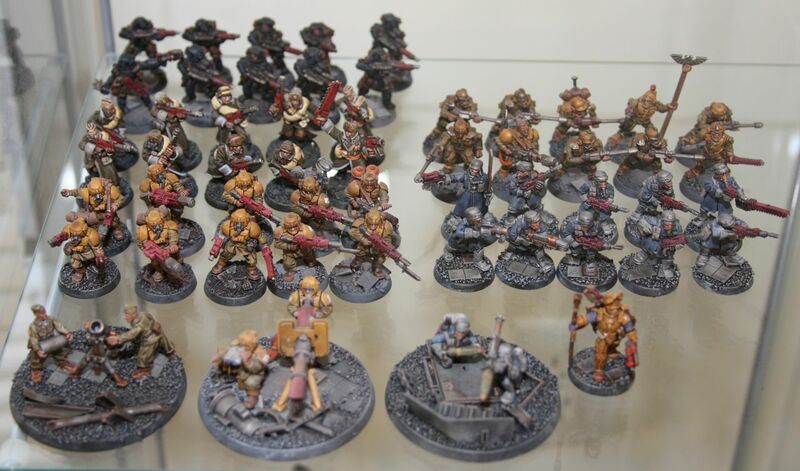 The only exception here is the valkrie, which I painted in Imperial Navy colors. So, am I succeeding, or is cohesion just a painters wish fullfilment? 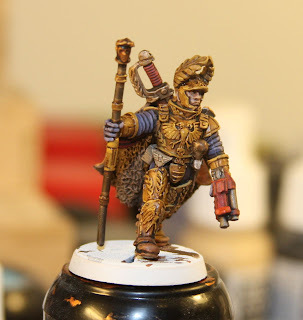 I based Solar M. as well as added one more gryphonne sepia wash. I am not sure the reddish was a good idea, but it did tone down the extreme highlighting that I had added. I had a lot of trouble with his cloak. 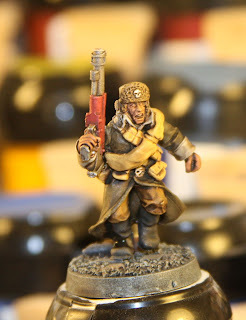 I have been using a lot of vallejo paint and I tried out their ochre brown. My pot of it simply does not cover. It seems like the medium and pigment are slightly separated as well. 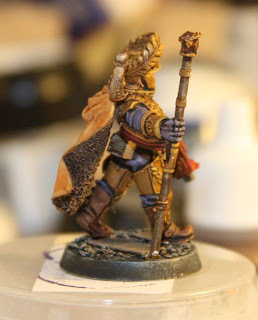 I'm glad I tacked this old miniature before hitting my next troops choice. 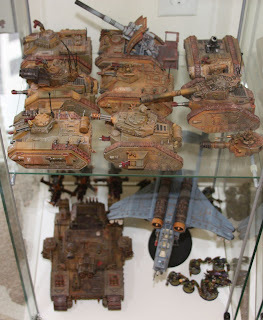 I now have so many guard and tanks that they are filling up my display cabinets. Maybe it is time to shift out my original Iron Scythes space marine vehicles. That would buy me another shelf for new work. the problem is that I really like seeing my old work. It gives me proof that my skills are improving. 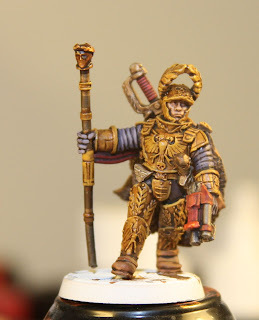 This helps tone down the frustration that sometimes comes when painting just doesn't go right. 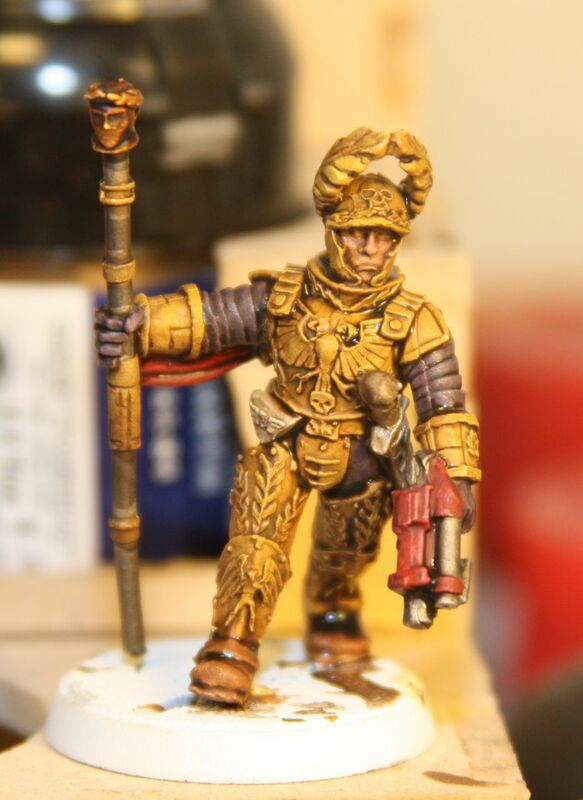 A badly frosted miniature from today is probably still painted to a higher standard than some of my first work! I thought it would be fun to post a WIP of my new multi-regiment war master. I was initially planning on just testing a color scheme on him and then stripping him down with simple green, but I think I will work towards the end on this guy and just see how he turns out. The first wash is drying now. 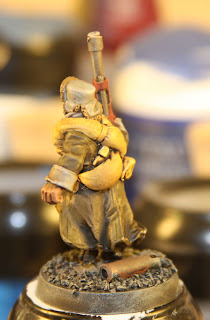 I plan to highlight the yellow up through bleached bone to white. 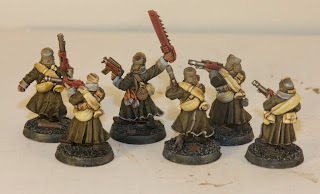 I've finished my one and only Valhallan squad.I learned a few things with these guys. 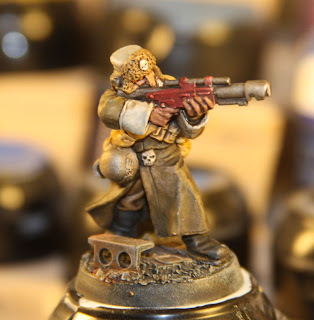 First off, I think I like subdued tones of the valejo paints more than GW paints. There are so many good color combinations, that recipes become pretty easy. Secondly, the fact that I standardized on red guns turns out to have been a really good idea from a force cohesiveness point of view. 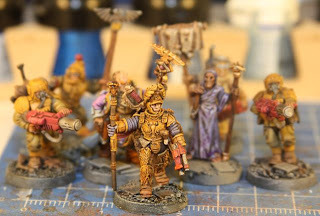 These guys fit right in with the rest of my guard army, even though they are wearing different uniforms and are slightly different scale. They even fit in with my inquisitional force due to that same visual link. 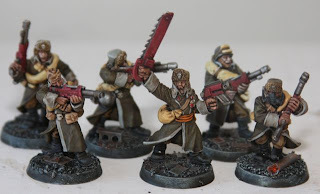 I am glad I don't have to paint 100 more of these guys, though I do have a squad of death corps that might need to be painted next. I can't wait to take a group shot of all of the different squads together. I am having so much fun with these guys I had to do some shading. 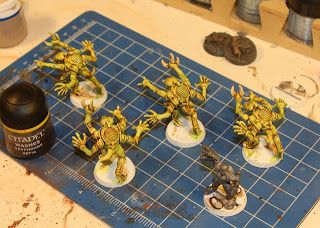 Basically I recovered each base coat with a very thin amount of the original color. The yellow-ish bags got slightly more treatment. I tried to paint on some folds that are not present on the actual minis. 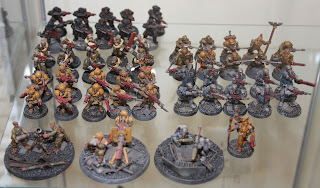 I would hate to have to paint 100 of these guys, but a squad of 10 is just right! I've decided to hold off on shading this guys until I have all of the base colors plush washes completed. This way I can do the shading as a batch process. There is a lot of work to do, but I like how these guys are turning out now, and have found a way to remove some of the yellow glare from my photos. 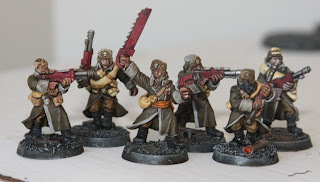 I think these guys will be right at home with my mostly cadian force. 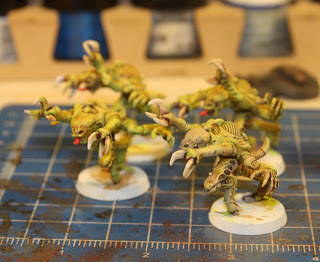 The washes are still drying, but I could not help myself from basing these test minis. 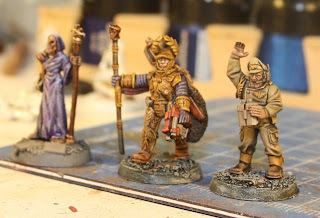 I am not sure if I like the sort of painterly look of the previous test mini, or these more muted guys. 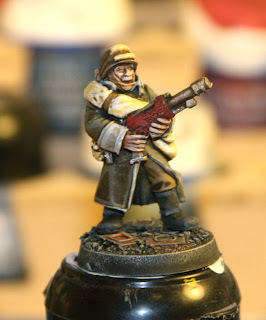 I am loving the Vallejo paints, though my paint thinner is acting really weird with them. 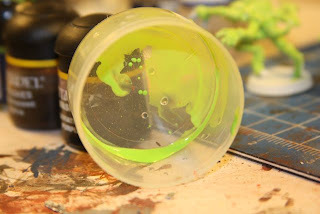 The thinner makes the paints clump together, and might be the reason the first mini looks so gloppy. I normally use the thinner as a way to help dissolve each layer into the next, but it just did not work this time around. 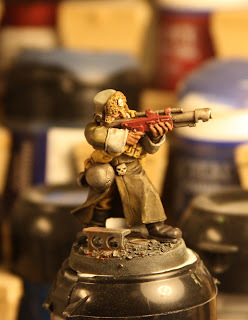 I have one squad of these Valhallan Imperial Guard, so I am trying to come up with a color scheme that fits with my mixed cadian regiment. I am really not sure of the painting on this guy. I like looking at it, but I see all kinds of flaws. I used Vallejo earth tones for most of the painting. I thought I should post this anyway to show a variant of the normal Valhallan theme. Maybe I will paint another one up and see if I do a better job. This guy could be looking at a simple green bath! I just added the first layer of forgeworld powders to the shadowsword. So far I have added the rust colored powder as a wash to the tracks, around random bits of machinery, and as streaks from whatever those circular things are on the side skirts. 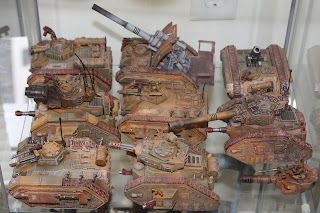 To make the wash I mixed FG rust powder into a large amount of Tamiya X20A thinner. Once the thinner had evaporated I dry-brushed very light deheneb stone over the whole tank. 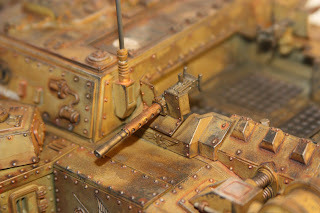 I think my next step will be to use the ash colored powder as a dust around the tracks and the side skirts of the model. 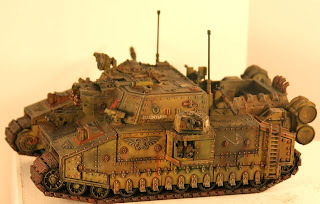 I've been having trouble getting good shots of the tank, but I think you get the general idea. 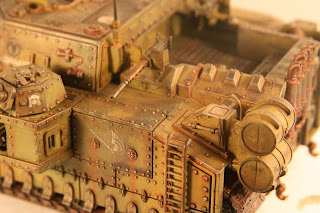 In the future I think I need to use more of a contract on the camouflage colors, so the heavy weathering has something to play off of. I've noticed that grey-blue tanks, look fantastic with rust colored patches. This guy is a bit monotone, but I am enjoying it again. 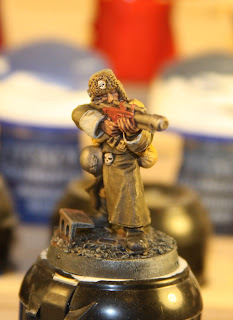 That whole dull coat incident really burned out my painting desire for a while. I wish I had reason to use this guy in a game. I've never played an apocalypse game, but think that might be my best chance. I don't have a gaming group here in DC, so I just rely on the GW springfield store. All this talk of narrative games has me itching to get involved in one. Imagine a strong narrative game where painting and modeling are part of the process. 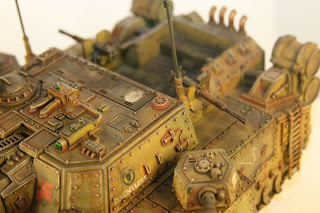 History could be added to each model as the game progressed. 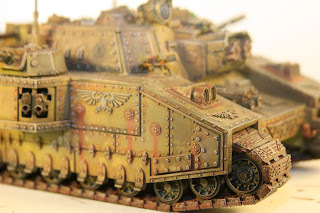 Units that had done well could have new battle damage, more weathering, battle honors etc. 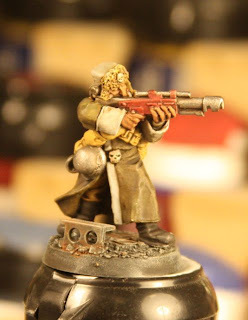 So a while back I won a painting competition with a genestealer. I have put off writing the step by step until now. 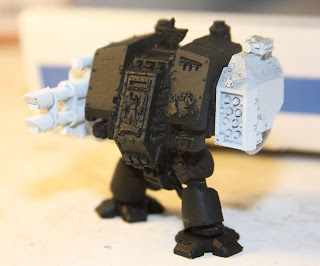 Rather than follow my original steps I decided to try the process using only water, white primer, and gw paints. The missing ingredient in this is Tamiya X-20A acrylic paint thinner. The process definitely works better with paint thinner if you have it but it still does ok with water. 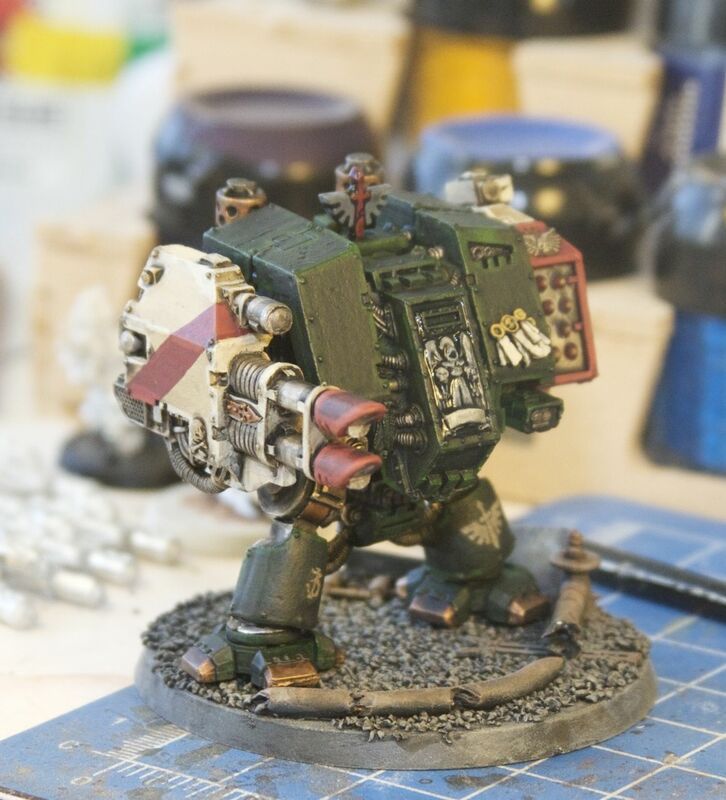 The key thing with this whole process is very thinned paints, followed by targeted washes. Mix Scorpion Green with a lot of water. It should be soupy and naturally shade the mini. It is best made using a few drops of paint thinner rather than water, but I used water here. Whatever you do, do not use an airbrush for this step. The goal is to not have any even dispersal of paint! 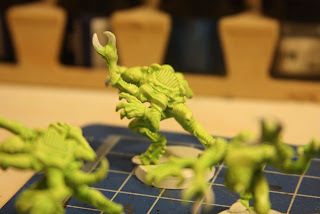 Paint the whole mini except claws. Wash the full mini with Gryphonne Sepia. The key here is to add a little thinner so the surface tension of the wash is broken. Again I used water here to see what would happen. 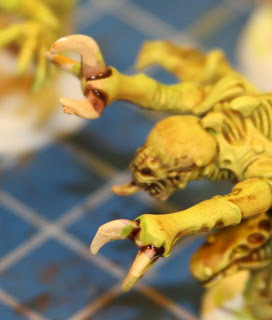 Once that was is essentially dry, use washes of Levian purple around the base of each claw. 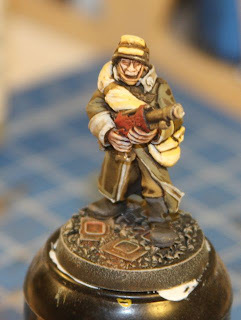 I also added some wash to the face detail on the mini, and a few random spots. The purple is key because it really pulls out the detail. I would not put too much on though. 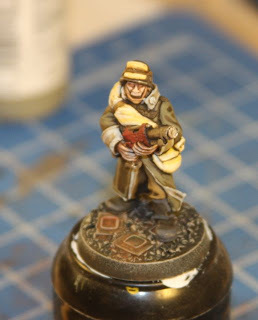 Dry brush the whole miniature with some light color. 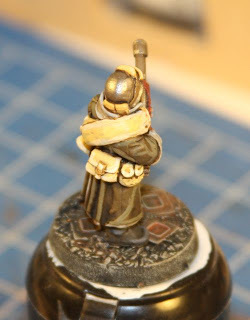 I used bleached bone on one of these, and will probably use the deheneb stone foundation paint on a different on. The goal here is to hit the top of the head, the hands, and boney protrusions. Be careful not to add too much. Make a bleached bone wash and hit the tips of the claws and hooves. 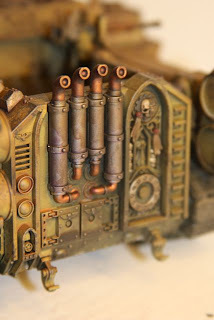 Finish this by adding some white to the wash to highlight just the tips. rinse and repeat. I like to vary the colors just a bit from model to model so the bugs do not look like carbon copies of each other. 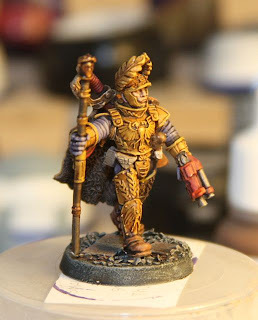 These take me almost no time at all to paint. I basically did them interspersed while doing other tasks. 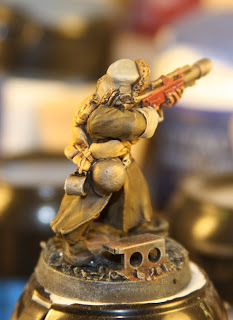 A careful approach to the washes will yield better results. 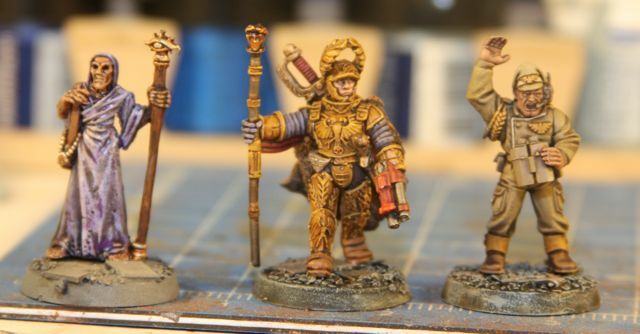 Paint thinner really shines when doing work like this, but I know many people do not have it.